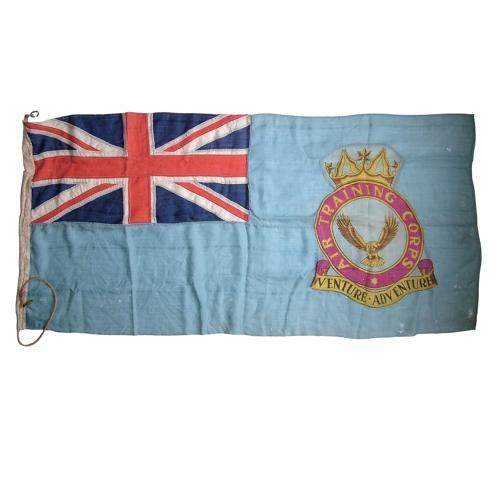 Air Training Corps ensign (flag). Woven cotton mix, approximately 80 x 195cm (31 x 76"). The union flag is made up from individually stitched panels and the ATC badge is a single printed panel stitched in place. With original jute rope and brass fittings. There is some soiling and moth/fray damage with areas of 'thinning' and some small holes as shown in the photographs. Unmarked. Reasonable overall condition and a great display item. The first A.T.C ensign we've had! Stock code M22822.